Think of the perfectly sophisticated office space - clean, shining hallways, occasional decorative plant, modern minimalist ceramics, and, of course, a large format aluminum photo print with a historical photo of the building (okay, you can insert whatever you fancy here). If there’s a format that was destined to signal importance, nobility, and might, then aluminum is without a doubt the best contender for the title. But, what exactly makes metal photo prints into such a great high-end decor? Let’s find out!. Aluminum photo prints surely take the cake when it comes to structural prowess. Built to last yet able do it in a way that does not rob them of mobility, aluminum prints are actually a very clever combination of aluminum and plastic sheets. 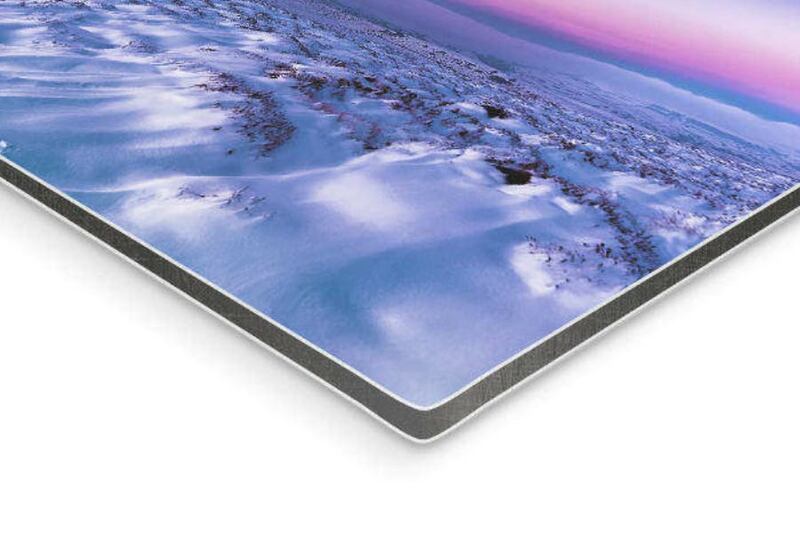 While the two aluminum sheets sandwiching a black plastic core provide a great balance, the layered edge of the frame provides the solid, bulky appearance. Meanwhile, the silver lining of the sheets adds a flair of expensive sophistication, making it a perfect trophy decor (such as for a portrait of the founding father of the company or a large format manifesto of your core values). However, do not be deceived by the looks, as each piece of aluminum wall art is actually really easy to maneuver and won’t require a hefty hanging system to set up. A large, 20” x 20” aluminum photo print will effortlessly hover on your wall and won’t feel overwhelmingly heavy in any way. There’s very little sense in displaying something that lasts long yet does not look decent enough to be held in a frequently populated environment. Luckily, photo metal prints are by no means a subject of bad printing practices. Being pretty much second to none, the photo print on aluminum boasts exceptional sharpness and powerful, instantly noticeable contrasts. The shiny, glossy surface area is not there purely as a visual aid. In fact, this precious addition is there, first and foremost, for protective purposes. The special layer protects the printed image from any undesirable, UV-induced effects while also significantly reducing the chance of damage instigated by humid environments. Although it’s safe to say that a precious decor item like an aluminum print would suit open, spacious, and publicly accessible places like hotel lobbies and hallways, the humidity resistance provided by the special foil makes it a great decor item for unorthodox places like bathrooms and kitchens. The print itself stays as true to the original image as possible, employing highly advanced printing techniques to acquire the desired effect. The tool in use is a solvent-free HP latex ink, which means that your print will not only stay pretty but will be perfectly safe for everyone enjoying it. The image itself is laid on genuine photo paper that is exactly like what they use in actual photo laboratories. As you can see, the list of ingredients is pretty much a top-notch one. Now, despite laying down an impressive red carpet in the previous paragraphs, it’s safe to say that aluminum prints are not there to rob you of your budget for office decorating. Even with the complex manufacturing process and long-standing results, our aluminum print maintains a fantastic price performance, costing up to 50% less than its regular retail price. Those lucky enough to catch any of the sales are in for even more reduced prices, making aluminum prints from CanvasDiscount.com into a high-end decor item for the price of regular canvas art. Surely, a contemporary working space cannot be imaginable without a huge piece of wall art featuring the iconic Albert Watson portrait of Steve Jobs or some variation on “Keep calm and…” quote. Among a myriad of quirky little design elements, photo prints have become the staple decor piece of both shared office spaces for up and coming startups as well as already established enterprises. Although one might choose to go with a simpler and less costly option, such as forex or canvas, photo aluminum prints offer a long-term quality that seems to be made to mark achievements, celebrate tradition, and inspire those who are spending most of their day in their operative headquarters. There’s simply no better way to display the famous William Bernbach Volkswagen Lemon ad, in case you need to shake up the motivation within your advertising company. There’s hardly a better way to inspire coworkers at your tech startup than by creating an aluminum print version of an early computer ad. These little things matter big time, and the foundation they’re printed on is essential to the general vibe.